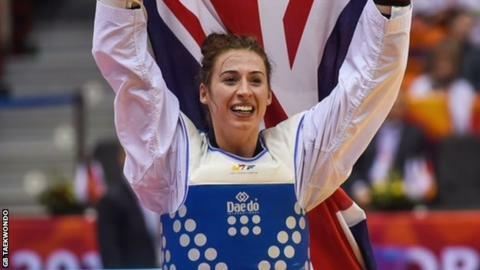 Taekwondo fighter Bianca Walkden has dedicated her World Championship gold medal to her late granddad, who passed away before her final on Sunday. The 23-year-old Briton had spoken to hospitalised Pasqual Discala before her semi-final earlier that day and he was aware that she had reached the final. However, the 74-year-old Italian sadly lost his year-long battle with illness shortly before Walkden claimed victory. "It was just so emotional for him," Walkden told BBC Sport. "It was hard standing there knowing he was back at home in hospital, but I promised I'd win for him." Walkden, who learnt of Discala's passing shortly after her +73kg victory, added: "Although it was a lot of pressure on my shoulders I couldn't let him down and this was all for my granddad." The Liverpool-born fighter, who trains in Manchester, has battled back from two serious knee ligament injuries over the last five years. The initial problem - which struck in 2010 - effectively ended her hopes of challenging former world champion Sarah Stevenson for a place in the London Olympic squad. The most recent was suffered shortly after claiming her maiden European crown in May last year, but Walkden has astounded many in the sport by returning to form six months ahead of schedule. "If I'm able to win the world championships when I'm not even at my best then, with another year until Rio, maybe I could even become Olympic champion," she said. "Deep down that's my dream, but I'm starting to believe that it's not just a dream and that with more hard work it is actually attainable." Walkden entered the World Championships ranked 12th in the global standings but should now rise into the top six. If she can maintain that position through to the end of the year, it will ensure Team GB a place in the women's +73kg division in Rio. Her next competition will be the inaugural Baku European Games in Azerbaijan, from 12-28 June.